Hello guys! I'm trying a long time to create a simple bot based on MACD, but I'm very confusing... Someone can give me a help or sample a MACD bot? Hi Sir, I offer development services at Binary.com. Please take a look at one of my bots...it is different than what you have requested but it gives you the idea on the User Experience you might get. 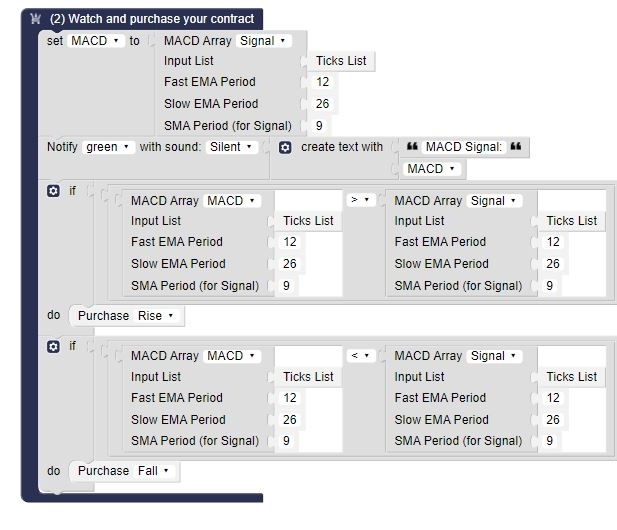 Cav, do you have MACD Histogram bot based on Tick Lists? 1) When the MACD is greater than the Signal there is an upward trend (rise); and the opposite: when the MACD is lower than the Signal there is a downward trend (fall). 2) When the Signal is below the Histogram there is an upward trend (rise); and the opposite: when the Signal is above the Histogram there is a downward trend (fall).